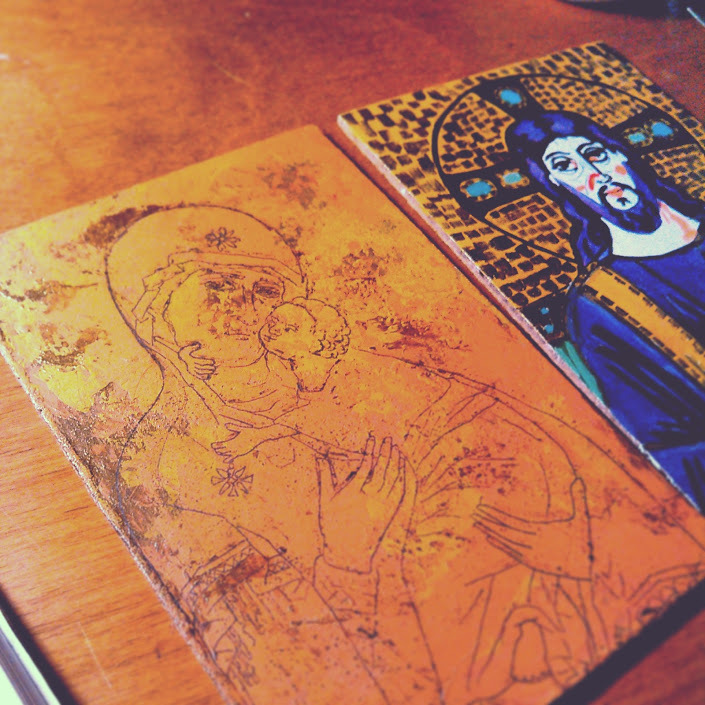 In the spirit of the pre-xmas season, I was feeling nostalgic, or had a visual craving for byzantine art. I decided to challenge myself and see if I could make a little copy of the Virgin of Vladamir, using acrylics. Thanks to those nice extenders and other mediums you can mix in, plus a spray bottle and some plastic wrap, I got the consistency and working life I needed to complete this task. I think I worked on it for at least 3 days. Maybe more. I should have kept a log of my time, because it could go on record for the most patience I’ve ever exerted on a painting, ever. The beginning stages of my study. I started by mixing colors to match the image I was working from. I layered them on with my palette knife, alternating between colors and the interference gold concoction I mixed. I wanted to get just enough gold down to show through, but not so much that it would look intentional or lay on top of the other colors. Next, I chose to transfer my lines by tracing my print out. I was aiming for a copy, and to me, this was more an exercise in color mixing, technique, and overall, testing the abilities of my acrylics. For the record, I was impressed, and I ought to be, because I was using “The Good Stuff:” primarily Golden brand acrylic colors and medium, and one or two heavy body Liquitex colors. 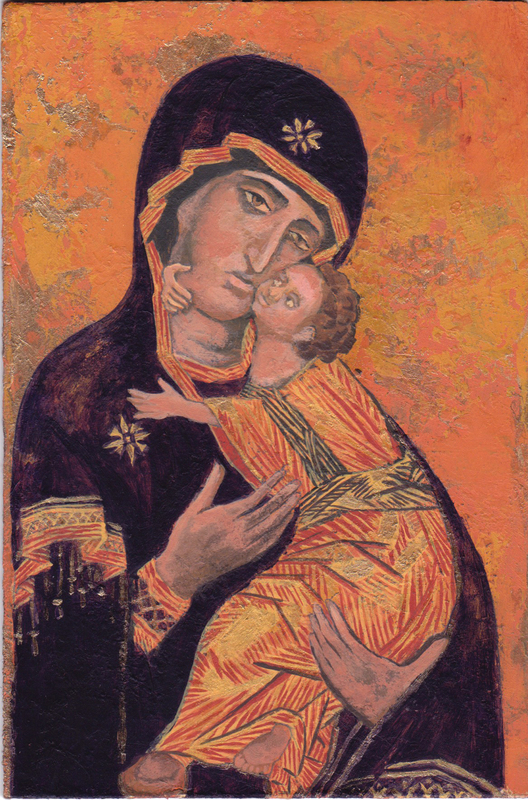 Study after Virgin of Vladimir, acrylic on Masonite, 4×6, 2014. Reflections of 2014, Resolutions for 2015.